The Pediatric Community-Acquired Pneumonia in Infants and Children >3 Months GUIDELINES Pocket Guide is based on the latest guidelines of the Infectious Diseases Society of America (IDSA) and the Pediatric Infectious Diseases Society (PIDS) and was developed with their collaboration. 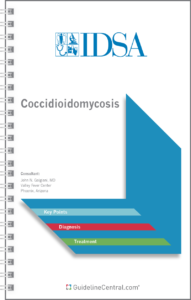 This practical quick-reference tool contains prevention advice, management decision recommendations, severity assessment instruments, diagnostic and treatment recommendations, an effusion management algorithm, and viral and bacterial drug therapy tables with detailed dosing information. Everything a healthcare professional needs to know about the PCAP Guidelines. For definitions of the abbreviations in green see Table 9. Pneumonia is the single greatest cause of death in children worldwide. Each year, more than 2 million children younger than 5 years die from pneumonia, representing approximately 20% of all deaths in children within this age group. In the developed world, the annual incidence of pneumonia is approximately 3-4 cases per 100 children younger than 5 years. Incidence varies inversely with age. Vaccines have dramatically decreased the incidence of infections, including community-aquired pneumonia (CAP). Pathogens responsible for "atypical pneumonia" have been identified in 3% to 23% of children studied, with Mycoplasma pneumoniae more often identified in older children. Viral etiologies of CAP have been documented in up to 80% of children younger than 2 years. In contrast, investigations of older children, 10-16 years, who had both clinical and radiographic evidence of pneumonia, documented a much lower percentage of viral pathogens. Respiratory syncytial virus (RSV) is consistently the most frequently detected virus, representing up to 40% of identified pathogens in those younger than 2 years, but rarely identified in older children with CAP. Less frequently detected are adenoviruses, bocavirus, human metapneumovirus, influenza A and B viruses, parainfluenza viruses, coronaviruses and rhinovirus. Note: A positive influenza test may both decrease the need for additional diagnostic studies and decrease antibiotic use, while guiding appropriate use of antiviral agents in both outpatient and inpatient settings. a Adapted from World Health Organization (WHO) criteria. a Clindamycin resistance appears to be increasing in certain geographic areas among S. pneumoniae and S. aureus infections. b For β-lactam–allergic children.